How to use the POI app? 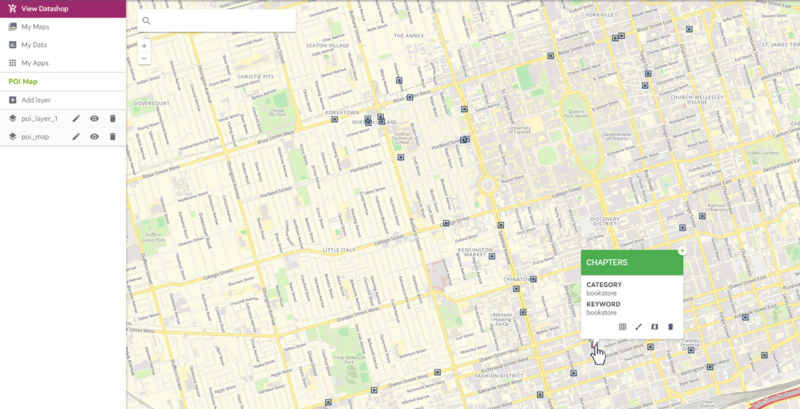 With the POI app (Spotzi Premium Plan) you can quickly find POIs and plot them on the map. An ideal solution for companies that want to know more about the available points-of-interest in certain areas like restaurants, bus stations, ATMs etc. With the Spotzi POI App you are able to find all kinds of POIs within a certain radius or in a certain area (district, city). In the guide below we will show you how this POI app works. Accounting, Airport, Amusement park, Aquarium, Art gallery, ATM, Bakery, Bank, Bar, Beauty salon, Bicycle store, Book store, Bowling alley, Bus station, Cafe, Campground, Car dealer, Car rental, Car repair, Car wash, Casino, Cemetery, Church, City hall, Clothing store, Convenience store, Courthouse, Dentist, Department store, Doctor, Electrician, Electronics store, Embassy, Fire station, Florist, Funeral home, Furniture store, Gas station, Grocery or supermarket, Gym, Hair care, Hardware store, Hindu temple, Home goods store, Hospital, Insurance agency, Jewelry store, Laundry, Lawyer, Library, Liquor store, Local government office, Locksmith, Lodging, Meal delivery, Meal takeaway, Mosque, Movie rental, Movie theater, Moving company, Museum, Night club, Painter, Park, Parking, Pet store, Pharmacy, Physiotherapist, Plumber, Police, Post office, Real estate agency, Restaurant, Roofing contractor, RV park, School, Shoe store, Shopping mall, Spa, Stadium, Storage, Store, Subway station, Synagogue, Taxi stand, Train station, Transit station, Travel agency, University, Veterinary care, Zoo. 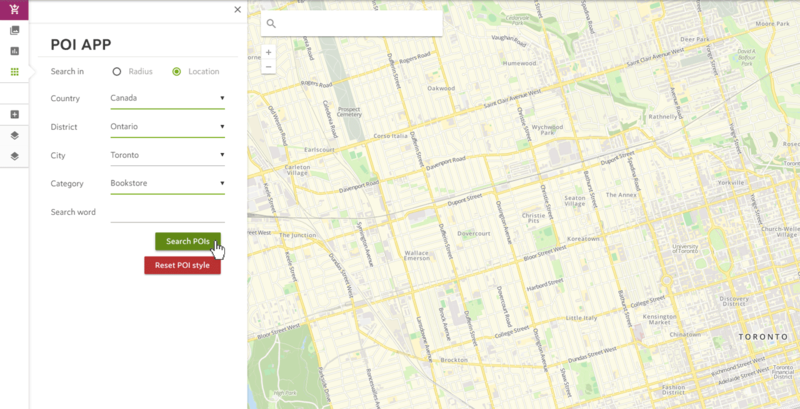 Select a map and open your POI app. In order to enable the POI App, press the App and our system will ask you to name your POI layer if you haven’t already added a POI layer. Once you have chosen the radius and category/searchword. Click the SEARCH POIs button. Currently we only offer the POIs of all North American countries. This contains: USA, Canada, the Cayman Islands, Puerto Rico, the Bahamas and the Virgin Islands. Are you interested in POIs from other countries? Please contact us. 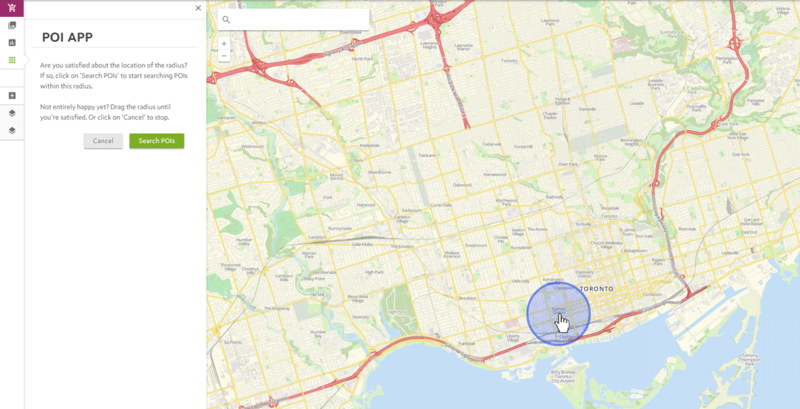 Now you have to click on the map to set a radius. After you have selected a radius, click SEARCH POIs to start searching POIs within that radius. When the POI finder is finished it will plot this data into your POI data layer. This data can be styled and added to any map in your Mapbuilder account. 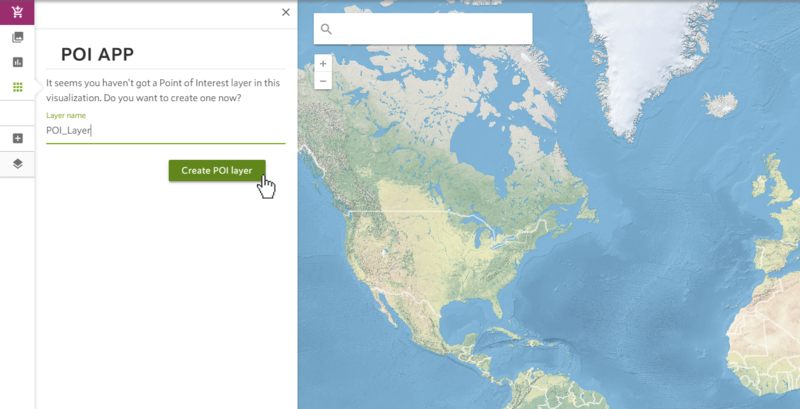 You can also create a new map from your new POI layer. This can be achieved by creating a map from existing layers. 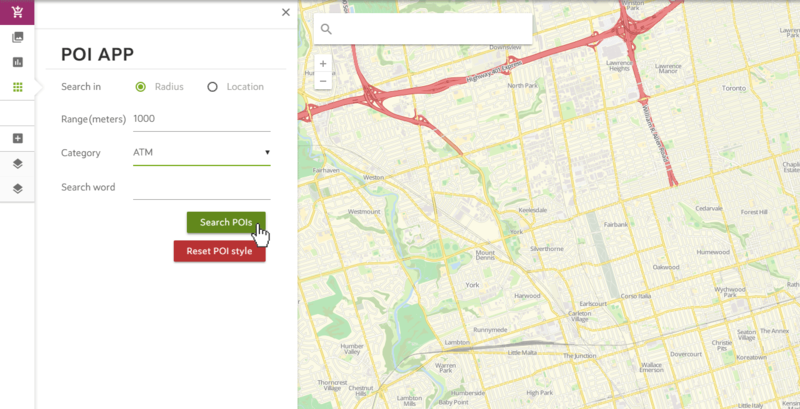 You can also export this data to a CSV, XML, JSON or Shapefile, so you can use this POI data in other mapping solutions like QGIS or Google Maps. It is also possible to export this data to Excel or CSV. How you export this data can be found in our documentation about exporting data. 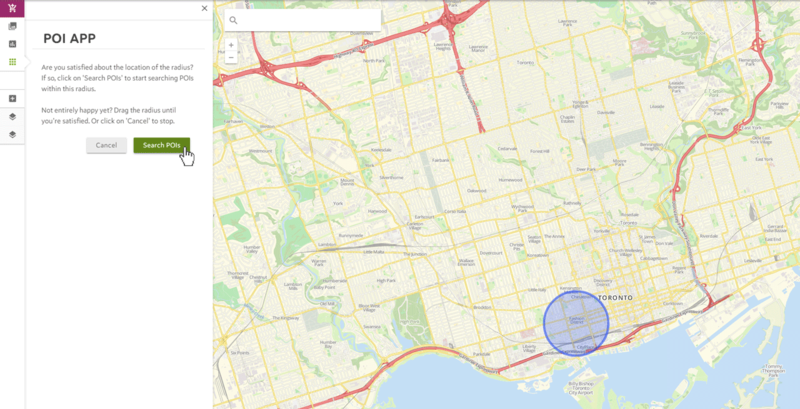 Once you have chosen the location and category/searchword Spotzi will find POIs based on your search. When the POI finder is finished it will plot this data into your POI data layer. 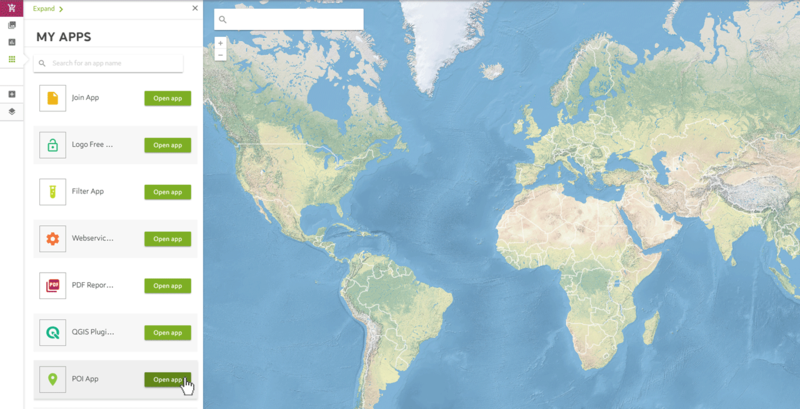 This data can be styled and added to any map in your Mapbuilder account. You can also create a new map from your new POI layer. This can be achieved by creating a map from existing layers.